Hillthwaite015394 43636work015394 88660fax HotelThe family-owned Hillthwaite, between Windermere and Bowness, is one of area's highest hotels overlooking England's largest lake and with magnificent panoramic views over to Langdale Pikes, Crinkle Crags and Coniston Old Man. Within easy reach of the M6 motorway this 3-star, 34-room hotel offers a warm Lakeland welcome with a reputation for superb food and friendly service. Rooms are maintained to a high standard, all have en suite facilities and some have lake or fell views. The ground floor suite of public facilities includes a comfortable lounge with a well-stocked bar, a delightful conservatory and impressive restaurant with stunning bay window views of the unique South Lakes skyline. 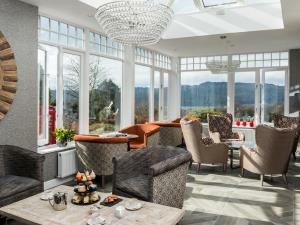 In the summer months the terrace overlooking Lake Windermere is a favourite rendezvous where guests can relax and take in Cumbria's ever changing tapestry of colours. Or they can enjoy the exclusive use of the year-round leisure facilities including a heated swimming pool, steam room and sauna. Hillthwaite sometimes limits bookings to 3 or more days. Have a Lake District break at Hillthwaite. All rates are inclusive of Hillthwaite Cooked to Order Breakfast, with a continental buffet to choose from as well, accommodation, access to the hotels onsite leisure facilities, free unlimited wi-fi and ample onsite free parking. Classicplus dbl sometimes limits bookings to 3 or more days. Cosy Double sometimes limits bookings to 3 or more days. Occasion sometimes limits bookings to 3 or more days. Half way between Windermere and Bowness, Thornbarrow Road is a turning off the main link road, approximately 0.5miles from either village. We found car parking arrangements satisfactory. Meals and bar service were fine. We found the plumbing to be challenging to say the lest. The shower controls mystified us for some time until we worked them out. However, the water temperature could not be kept stable resulting in random cycles of very hot or freezing cold water.